Indigenous Languages Native American Cultures What's new on our site today! Welcome to our Alabama State Facts section, part of an educational project designed to provide information about indigenous people in different U.S. states. Follow the links to the right of our tribal map for more information about the language, culture and history of each Alabama tribe, or scroll below the map for Alabama Indian activities for kids including a wordsearch, fact sheets, and words from the Native American languages of Alabama. Feel free to print any of these materials out for classroom use! 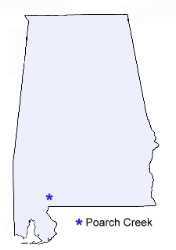 Did you know the name "Alabama" is a Muskogean Indian word? It meant "campsite" or "clearing," and became used as a name for one of the major tribes in the area, the Alabama (or Alabamee) Indians. The Alabama Indians were not the only native people of this region, however. Most Native Americans were forced to leave Alabama during the Indian Removals of the 1800's. 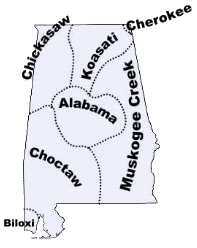 These tribes are not extinct, but except for the descendants of Alabama Indians who escaped from Removal, they do not live in Alabama anymore. They were moved to Indian reservations in Oklahoma and Texas instead. If you click on the link for each tribe, you can find more information about them. There is one federally recognized Indian tribe in Alabama today. Alabama Tribes Word Search: Printable puzzle hiding the names of Alabama's Indian tribes. Alabama Language Greetings: Learn to say "hello" in several Native Alabama languages. Alabama Native Animals: Learn the Native American names of Alabama animals. Write Your Name In Cherokee: Directions for using the Cherokee writing system to spell English names. Alabama Facts for Kids: Answers to frequently asked questions about the Indian tribes of Alabama. We currently have pages for the Cherokee, Chickasaw, Choctaw, Coushatta, Muskogee, and Alabama Indian tribe. Alabama Native Americans: Introducing the Native Americans of Alabama to kids. They Say The Wind Is Red: History of the Alabama Choctaw tribe. Prehistoric Indians of the Southeast: Archaeology of Alabama and the Middle South: Ancient Alabama Indian history. Indian Place Names in Alabama: The native etymology of present-day place-names in Alabama. Historic Indian Towns in Alabama: Ethnography and historical geography of Alabama Native Americans. The Winding Trails: Kids' book on the Alabama-Coushatta tribe. Myths and Folktales of the Alabama-Coushatta Indians: Traditional Koasati and Alabama Indian stories for sale. Alabama Indian Affairs Commission: State bureau representing American Indians in Alabama. Indian Tribes of Alabama: History and genealogy of the Cherokee, Choctaw, and Creek Indians in Alabama. Alabama History: Indian Removal Era: History and the texts of four treaties with the Alabama Creek and Cherokee Indians. Early Settlers of Alabama: Cherokee Indians: Article on Cherokee Indian history in Alabama. Poarch Creek Indians of Alabama: Article on Creek Indian history and culture in Alabama. Introduction to the Alabama Creeks: Information, lesson plans, and maps showing the location of Indian villages and other settlements. The Creek Indian Wars in Alabama: History of the Alabama Indian role in the War of 1812 and the Creek War of 1836. Prehistoric Alabama: Articles on ancient Alabama tribes from the Paleo-Indians through the Mound-Builders. Southeast Indian Artifacts Guide: Photographs and descriptions of arrowheads and Indian relics from Alabama and Georgia. Moundville Archaeological Site: Online museum exhibit on Alabama's Indian mounds and the culture that built these sites. Native American Indian tribes of Alabama: Historical overview of all the main Indian groups in Alabama. Moundville Alabama Indian Festival: Pictures from Alabama's annual Native American cultural event. Would you like to sponsor our nonprofit work on Alabama languages?